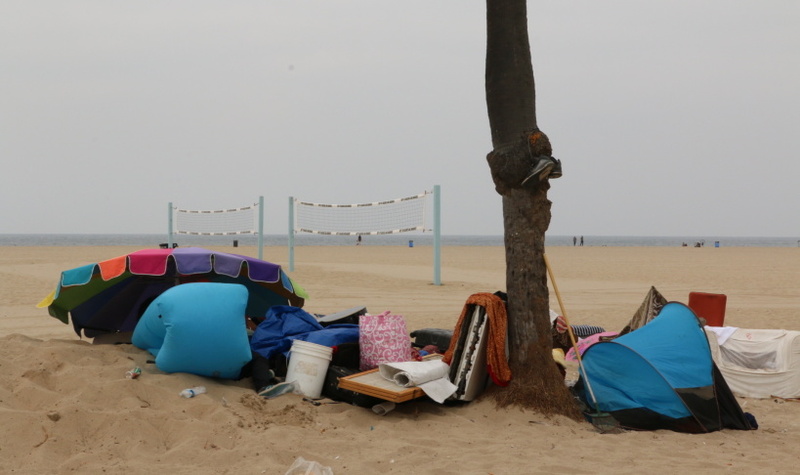 Things turned ugly, really ugly, at last week's neighborhood council meeting in Venice. About two hundred people attended the meeting, where city representative Tanaz Golshan had come to explain the concept of Mayor Eric Garcetti's "A Bridge Home" homeless shelter initiative. One such shelter has been proposed in the community. Within minutes, people were yelling and booing at Golshan. At least one person started chanting "Lock her up!" — a familiar phrase in current politics, although not one typically directed at city officials. The Venice Neighborhood Council posted a video of the meeting on its Facebook page (Golshan gets up to speak at about 14:30). Neighborhood council leaders had to step in several times to restore order as Golshan attempted to explain the process the city is taking to select and run shelter sites and address residents' concerns. Some in the crowd didn't want to hear it. "Not only do they [homeless people] need housing because it's their right," Golshan says to the audience, (to which some in the crowd yell, "No, it's not!") "but we have found statistically... getting services is most effective for people when they're under a roof." "Give 'em your house!" one man screams at her repeatedly as a few others applaud. The confrontation is one example — although it's not the first — of the outrage and division that Garcetti's Bridge Housing plan has faced. When the mayor and City Council President Herb Wesson announced plans for a similar shelter in Koreatown in May, residents and business owners there responded with protests and petitions. The shelter plan was put on hold as city officials scrambled to find a new approach that would address residents' concerns. 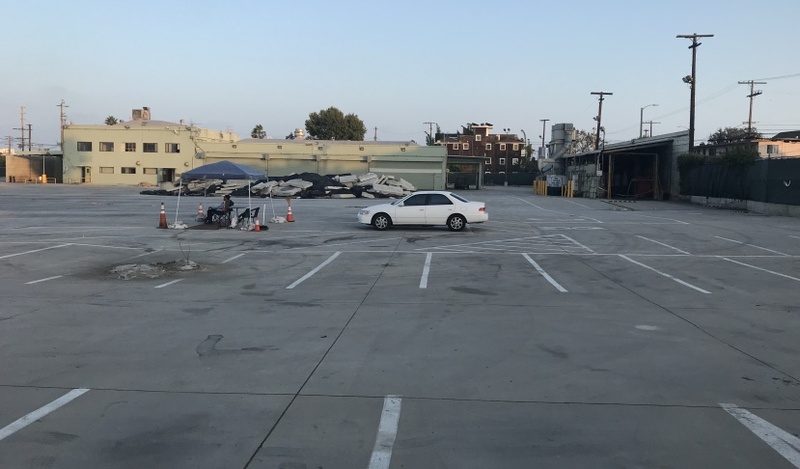 Roughly a month later, Wesson announced a new site for the shelter had been agreed upon by residents — although it's arguably not technically in Koreatown. The city is working on permanent housing solutions for the homeless, a process that can take months. While people wait for that, they end up on the streets. That's where short-term bridge housing comes in. Unlike typical emergency shelters, these bridge shelters will be open 24/7 and will allow pets, storage for personal belongings and the opportunity for families and circles of friends to remain together. It also will include restrooms, showers, food and security. Residents will have access to case management services and social workers, with the goal of to helping them transition into long-term housing. 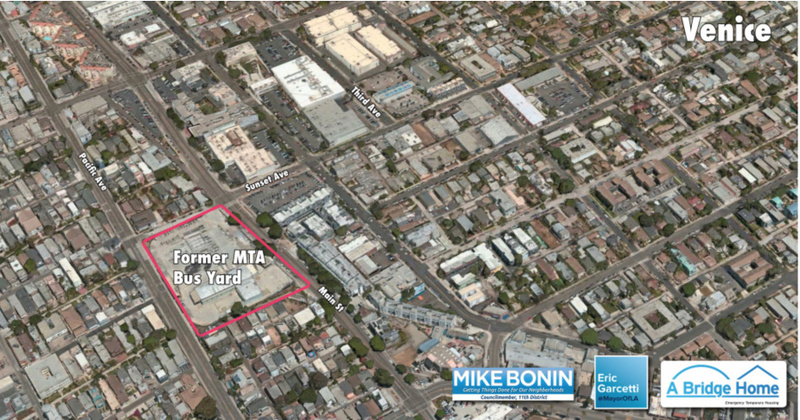 Most of the controversy at last week's Venice meeting was over the site Councilman Mike Bonin has chosen for the shelter: a 3-acre former MTA bus yard, located in the heart of Venice between two homeless encampments. "I have a son who's one (year) old and I want him to be safe. But I also want him to grow up in a community that shows empathy and compassion in the face of adversity. And homeless people are part of our community whether we want it or not," she said. "I'm for it because the homeless people are people too," said longtime Venice resident Jataun Valentine. "I've had people in my family and my neighbors and people I've went to school with that were homeless and some of them haven't gotten themselves together. But if there's no program they'll never get themselves together." In the most recent homeless count by the Los Angeles Homeless Services Authority (LAHSA), more than 900 people were found to living on the streets or in shelters in Venice — the highest concentration in Bonin's district. "I asked people around the district where should we provide relief from encampments with this program and overwhelmingly the answer was Venice," Bonin told LAist/KPCC in an interview before the public meeting. "People have died on the streets in my district and that's happening on my watch, so I think I have a moral responsibility [to do something]." Opponents say they worry about their safety and diminishing property values, along with a host of other issues. Last week's meeting was supposed to include a vote on a motion introduced by Will Hawkins, who chairs the homeless committee on the Venice Neighborhood Council. "What I tried to do with this motion was get ahead of that and make sure that the community was at the table before any plan was put in stone," Hawkins said. His motion stated that the neighborhood council would support bridge housing if the city signed something called a Community Benefits Agreement, which essentially makes the city legally required to deliver on certain promises, like more police and sanitation support. Mayor Garcetti has committed to this already but many residents are nervous he won't deliver. Almost no one at the meeting brought up the specifics of Hawkin's motion. Instead, residents focused mostly on Bonin's location choice. Traditionally, the obstacles to solving homelessness have been lack of funding, lack of political will and lack of new ideas. But, according to some residents, the main issue in this case is misinformation. "There's been so much subterfuge and so much misinformation out here, are you really listening to us and taking our feedback or is this a done deal?" Alix Gucovsky asked during the public comment section. Many who spoke that night echoed her sentiment. "The biggest problem with this bridge housing is that there was never a meeting saying what they're gonna do, this is how were going to do it and then let the people of Venice chime in," resident Nick Antonicello said. "That never happened! (Bonin) pushed this down everyone's throat and now it's backfired." Neither Bonin nor Mayor Garcetti were at the meeting that night. Bonin has held one open house with service providers to answer community questions but many residents felt that wasn't enough. Antonicello and others preferred a town hall format where the councilman would have to stand in front of the community and answer questions instead of the more informal format of an open house. Mayor Garcetti canvassed Venice residents earlier this month and has met with community leaders, although not in a public format. Garcetti has delegated much of the community rollout of the shelter initiative to the representatives of each district. 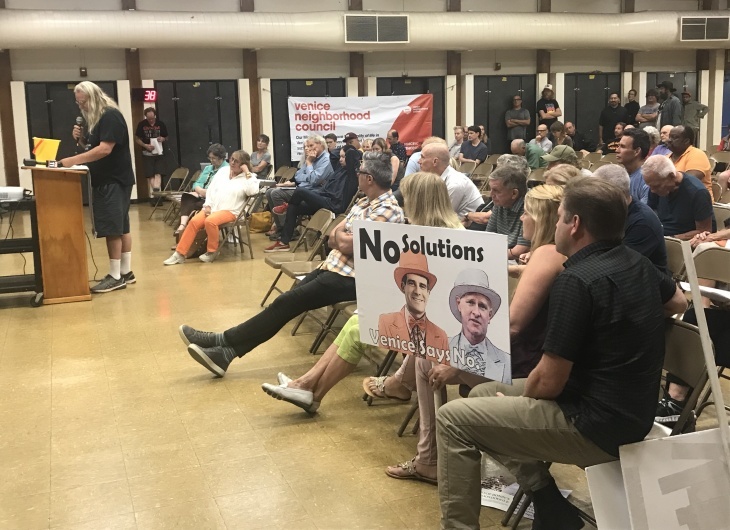 The lack of inclusion some Venice residents complained about all night was exactly what Will Hawkins was trying to address with his motion at the meeting. But before the vote could begin, it was postponed. A majority of the council decided they didn't have enough information to vote on it. According to Hawkins, there is no plan at this point to revisit the motion. Legally speaking, the mayor doesn't need community support to build bridge housing on the MTA lot because it's city property. But he's been clear that he wants the community's backing. "I never dismiss fears," Garcetti told LAist/KPCC. "I think it's really important to understand them and to answer them. One thing we all know is the status quo has failed and... one thing we can't do is just walk away from a solution, and walk away from one that works." Garcetti said the city has learned a lot of lessons in recent years and this new housing is based on concerns he has had. "If something was going up in my neighborhood, I'd want more cleaning. I'd want a guarantee of safety. We want these to be safer than today. We want these to be more effective than today. And we want them to lead to a place where we can bring encampments down, reduce criminal activity and help people permanently get out of homelessness," Garcetti said. For his part, Councilman Bonin says he plans to hold more community events in the coming months. LAist news editor Ryan Fonseca contributed to this story.